In case you didn’t think it before, it’s time to get moving. Physical inactivity has been named as the largest public health crisis of the 21st century in both the UK and in the States, both pointing to the damages that sitting down too long can do to our health and wellbeing. It’s well known that being physically active is good for your mental and physical wellbeing but we are faced with a situation where around 4 in 5 workers in the UK have a desk job and most of our work is sedentary. On average, desk workers are sitting up to nine and a half hours a day. Say it with me: Let’s get moving. We have a responsibility as employers and employees to make a change, and we can start by creating a more active work environment. This doesn’t have to be a costly exercise, it’s not about installing a workplace gym or paying for a personal trainer for every desk-bound office worker. The good news is there are some very simple things you can do to create an active workforce. Introduce walking meetings. These can be especially useful for 1:1s among managers and their employees for a less formal check-in. 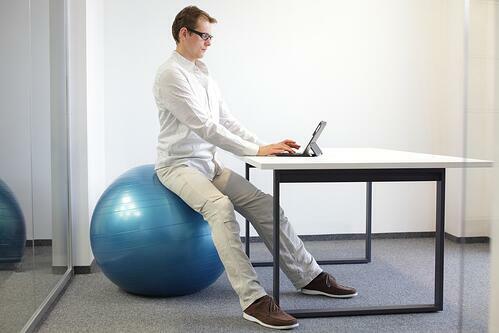 Give employees the option of standing desks throughout the day. Rather than buying one for all employees, which can be costly, consider setting up a “pod” of standing desks for people to use as they wish. Make your telephone calls standing up. Just roll back your chair and stand up. Simple. Encourage others to do the same. Swap some of your chairs for stability balls. The rule of thumb is to start slow with this method, swapping out your chair for a ball just 20-30 minutes a day, and build up to more. If you’re prone to back pain or lower back issues, it’s best to check in with your doctor before making big changes to your workstation. Adopt a 5 in 55 rule. This one’s really easy to remember: Every 55 minutes get up and MOVE. One journey to take? Head to the cafe for a drink of water to keep hydrated throughout the workday. Take the stairs not the lift. No matter what floor you’re on, this will make a big difference. Invest in wearable technology or a pedometer. Some companies will offer options for wearable technology as part of the benefits package (like Reward Gateway), but you can also hunt around for deals online. The majority of these techie finds will have in built software to remind you to get up and get moving, as well as help you measure your steps, too. Move around the workspace. 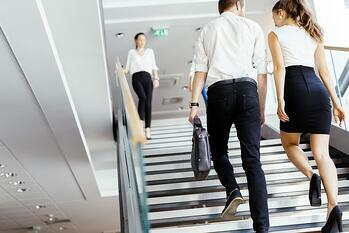 Walk across the office to share an idea with your colleague rather than emailing or messaging. Or ask them to meet you in the cafe or on another floor to get away from your desks. Consider hot desking. Many offices (especially in the UK) are making a move toward a more agile workplace. Part of this is hot desking, where employees don’t have a specific seat or any personal belongings at a desk, so they sit in a different seat every day. Reward Gateway’s new London office requires you to take your belongings with you as you move around, encouraging movement throughout the day to different desks or workspaces. Certainly not exhaustive or extensive, but we hope these simple tips will help you get your office moving. Really gives a whole new meaning to “sitting down on the job,” doesn’t it?